The Chicago Bears have been one of the league’s most active players in free agency under general manager Ryan Pace. Despite a number of quality additions over the past few years, the lack of any success at the quarterback position has limited the Bears to a 14-34 record in Pace’s tenure. There’s reason to believe though, that this year could be different. Those reasons start and end with 2017 first-round pick, Mitchell Trubisky. As a rookie, he was limited severely by conservative play-calling and a paucity of receiving talent. Still, the second overall pick managed a respectable 75.7 overall grade when all was said and done. If the Bears are going to fight through one of the toughest divisions in football and make the playoffs in 2018, it will be because new head coach Matt Nagy works his magic on his second-year quarterback. There’s no guarantee that Chicago can see a Sean McVay-esque turnaround with Nagy and Trubisky, but it’s not unreasonable to see the parallels. 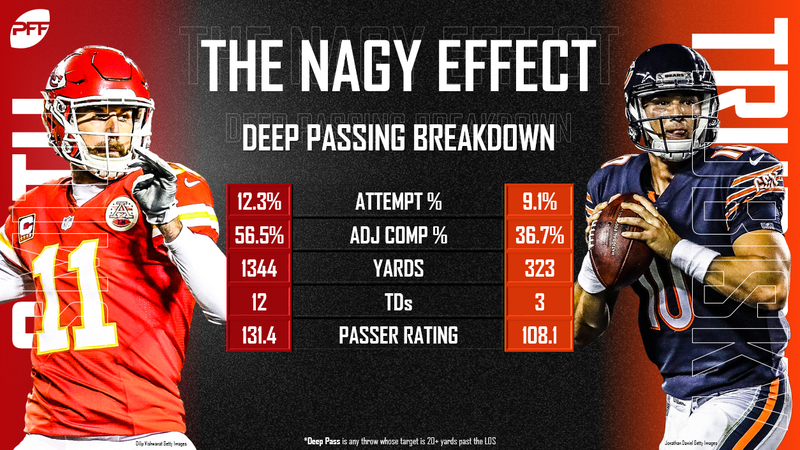 Nagy comes from one of the league’s most creative offenses in Kansas City – the same coaching tree that just produced Super Bowl winner Doug Pederson. Nagy is fresh off transforming the league’s most conservative quarterback into the league’s most productive deep thrower. A season ago, Trubisky was undoubtedly hampered by play-calling. Chicago threw the ball the 6th-fewest in the NFL despite having the lead for the 22nd-most time in the league last year. It’s safe to say that those training wheels will be taken off in Nagy’s offense. Trubisky will be allowed to sink or swim, but with an influx of talent offensively, there’s a good chance it’s the latter. While Trubisky should look vastly different in 2018, the receivers catching his passes will look different. That’s a good thing. Last season, Kendall Wright led the Bears receiving corps with a 76.3 overall grade while seven different wide outs notched at least 150 snaps. It was a revolving door of ineffectiveness. This season, the Bears top four options will all be new(ish) faces. Splash free agent signing Allen Robinson is their new No. 1 receiver. Injury-riddled former top-10 pick Kevin White is finally (knock on wood) healthy and will be slotted as their No. 2. 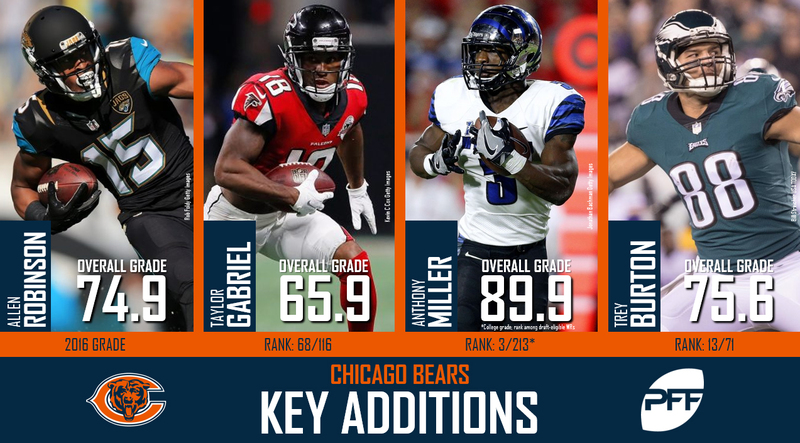 Second-round pick Anthony Miller is set to man the slot, and free-agent signing Trey Burton should be their primary option at tight end. The scary part about all the new faces is also what makes them so intriguing: we simply have no clue what to expect from any of them. Those four played a grand total of 395 snaps in the NFL last season. Robinson could be the receiver that earned an 87.5 overall grade back in 2015. White could live up to his top-10 billing. Miller could be the YAC-monster that broke 19 tackles at Memphis last year. The possibilities are endless. At the same time, Robinson could still see ill-effects from his knee injury, White could never live up to the hype and Miller could see traditional rookie struggles. Either way, there’s a zero percent chance this receiving corps is worse than it was a season ago and that is a good thing for the Bears offense. While the offense has seen it’s fair share of upheaval, the defense has remained relatively status quo. That remained true even at the top as defensive coordinator Vic Fangio survived the head coaching change. That’s a good thing for the Bears heading into 2018. Staying with Fangio in Chicago is their up and coming secondary. The Bears quietly had the ninth-best coverage grade of any team in the league last season and re-signed free agent corners Prince Amukamara (81.2 overall grade) and Kyle Fuller (84.3). The lynchpin to the defense though could be its newest member. If you’ll think back to Fangio’s time with San Francisco, Navorro Bowman and Patrick Willis were the superstars in the middle. Fangio’s zone coverages took advantage of their range in the middle of the field. The Bears defensive coordinator just so happens to have found another linebacker with Willis’ traits. 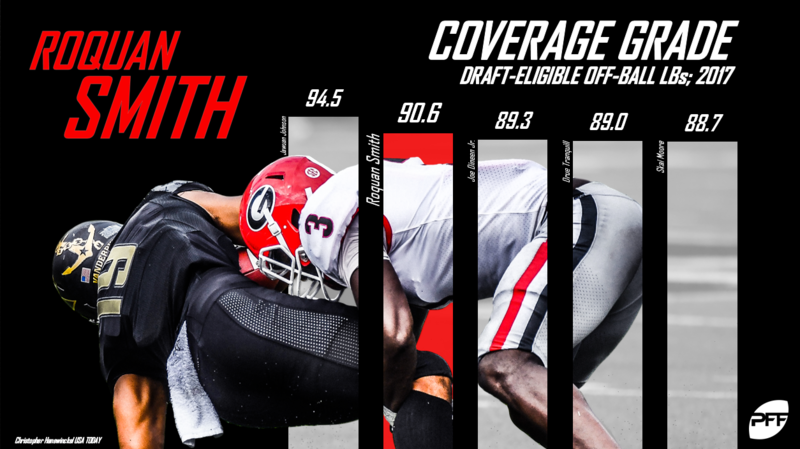 Roquan Smith was PFF’s highest graded off-ball linebacker in college football a season ago and the seventh-ranked player on our big board. The comparisons to 49ers linebacker Reuben Foster – who had a 90.7 overall grade as a rookie – write themselves. Only Smith doesn’t have the off-field issues. Adding that type of production to an already top-10 defense along with a vastly improved offense could transform the Bears from bottom feeder to wild card contender overnight.